On Dec. 15, The College of Wooster will begin the Collaborative Research Environment (or CoRE) project — a renovation of the first floor of the Andrews library. The project is scheduled to be finished by the time students come back for spring semester classes on Jan. 12. The new space will offer additional collaborative spaces, presentation practice rooms, advanced technology and staff to support the College’s research, writing and new media needs. 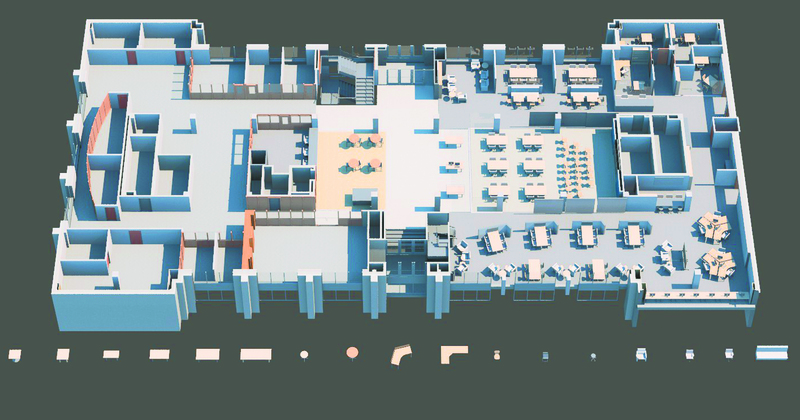 The remodeling will include new group presentation/small seminar rooms, flat-screen displays, offices for three librarians, a digital media lab and “tech bar,” a café with seating, movable wall installations, LCD screens and mobile white boards. Upon entering the Beall Avenue entrance, on the left where the current main desk is will be a small café with a few tables. Continuing clockwise to the right, the far wall will include a small lounge and two group presentation/small seminar rooms. These will provide informal study areas with flat-screen displays. 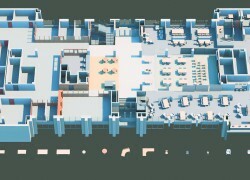 Continuing to the top right corner (see photo below), there will be offices for three librarians along with a staffed technology bar. The staff will be readily available to help students. The northeast corner of the library will feature high-end technology stations. These will have advanced multimedia-editing capabilities. Next to these tables will be a “tech bar” staffed with tech-savvy students who can assist students with media projects as well as help understand certain technologies and/or programs. There will also be a row of brand new public-access computers in the corner. Continuing along the wall will be more group project tables, each with a 6” wall section and LCD screens for collaborative projects or Skype interviews. There will also be movable white boards that groups can wheel up to their tables. Where the current public-access computers are, there will be a seminar-type of room where students can either work on projects or attend a seminar. This area will be surrounded by movable glass wall segments; these wall installations will be on tracks and able to be pushed back and completely out of the way for an open area, or closed to create a more defined “fishbowl” area for seminars or meetings. Each table will not only be equipped with outlets and internet ports, but also be movable. The goal is to make the space more open and collaborative, so students can come together and work on groups and bring their own laptops. The furniture to be purchased was also selected by students last semester during a trial period where students were able to sample furniture and vote for their favorites. Everything in the space is designed so students can bring their own computers more easily. Mark Christel, director of libraries, stated, “One of the unique things about the CoRE project is not just the spaces and technologies, but the staff and services that can help the students.” The IT staff at the tech bar, as well as the research/reference desk with librarians, will be right in the space with students, providing an even readier source of assistance, whether you’re trying to print or make an iMovie presentation. “There will be really quality help,” Christel said. Christel also stated that this project will allow the library and IT (and most likely the Writing Center) to work together on many collaborate programs. Most of the funding is from the college itself, with additional funding from grants from the McGregor foundation. Bohlin, Cywinski, Jackson is the architectural firm that developed CoRE. An article about CoRE was recently released in the library’s online newsletter earlier this week at http://libnews.voices.wooster.edu/academic-research-center/.